10 of the new genetic variants are linked to cancers that do not respond to hormone treatments. Scientists have had a breakthrough in breast cancer research, identifying 75 new genetic variants that can help recognise those who are most at risk of developing the disease. The ground-breaking discovery has been made following a large-scale research project, conducted by a huge team of 550 researchers coming from 300 institutions across the world. Around 1% of women are three times more likely to develop breast cancer compared with the general population, estimates suggest. Medical data for 275,000 women - including 146,000 who had been diagnosed with breast cancer - has been analysed as part of the OncoArray Consortium research project. The findings are significant in understanding the predisposition of breast cancer in patients, says Professor Doug Easton, a lead investigator in the research from Cambridge University. He continued: "As well as identifying new genetic variants, we have also confirmed many that we had previously suspected. 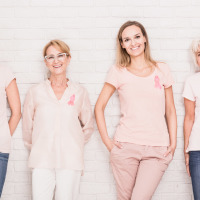 "There are some clear patterns in the genetic variants that should help us understand why some women are predisposed to breast cancer, and which genes and mechanisms are involved." Prior to the discovery, there were 180 known genetic variants that highlight familial risk of breast cancer. Broken down, 65 of the new variants can identify in four out of 100 patients whether their chances of developing the disease are doubled. However, a further 10 of the new genetic variants specifically relate to stubborn breast cancers - those which do not respond to known hormone treatments. These variants can be attributed to as much as 16% of the increased familial risk of this type of cancer. Baroness Delyth Morgan, chief executive of the charity Breast Cancer Now, has called the breakthrough an "exciting step forward in our understanding of the genetic causes of breast cancer". The Baroness says the identification of the new variants can be incorporated into existing research to improve early detection or even prevention of the disease in individuals. She added: "Crucially, the discovery of 10 new genetic variants that predispose women to ER-negative (oestrogen receptor negative) breast cancer could be particularly important." Breast cancer sufferers can have added peace of mind when taking overseas trips by taking out specialist medical travel insurance.